Other than the basic NTSC form, this game is quite rare in its Japanese form, since it was only released as a special contest game. They're easy to spot due to their shape, but not easy to come by. Welcome to the Big Leagues. 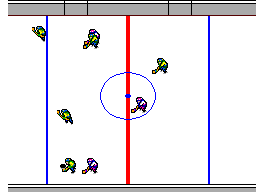 Here's a rough and tumble hockey game that takes a steady hand and quick reflexes. Because your mean opponents mean business. Teams line up in full defense. Tackle one another. 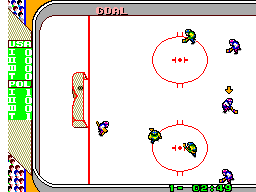 Scramble for the puck. Drive relentlessly for the goal. Victory for your team depends on you. So you need sharp techniques. Quickness. Power. And smooth stick-shifting ability. Show you have the right touch, hit the puck straight into the goal. 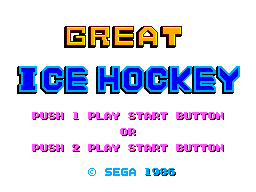 But just relax your guard, and see why they call the game of hockey "wrestling on ice." Manual Scan of the USA manual (by Roth) in .PDF format (Adobe acrobat required to view) 824KB in size.